Jack Hammer video slot is a NetEnt creation featuring a comic books design and plenty of bonus features. 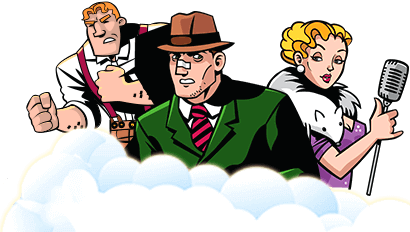 Join the sleuthing private eye as he hunts down the criminals making people’s lives a misery and you could just find yourself bagging a reward of as much as 750,000 coins! Bets will suit players with even the smallest of budgets, what with them starting at a reasonable 0.25 a spin. High rollers can bet as high as 200.00 a spin in this 5 reel, 25 win line slot machine. Head out into the dark city, listen to the gossip and read the headlines to see where Jack Hammer’s nemesis is. Evil Dr Wuten is not content with funny-phone calling people, he’s devised a plan that will see him poisoning his victims – and you must stop him! This action-packed Jack Hammer slot features sticky wins, re-spins, wild symbols, free spins, multipliers and big wins – will you manage to stop Evil Dr Wuten before he strikes again? Why is the Jack Hammer slot so special? Comics seem as big now as they have ever been, though perhaps they don’t have the mass market reach that they did in the 1930s pulp fiction heyday of the noir gumshoe that is celebrated in Jack Hammer, the fantastic crime-themed 15-reeler from NetEnt. The theming of some online video slots is skin deep, but Jack Hammer really brings the age of permanently smoking shooters and Good V Evil battles to life in vivid newsprint colour. The reels become a moving comic strip telling the story of our hero, the hale, hearty and hunky Jack Hammer, as he cleans up the city. A good looking game is a good start, but games don’t get or stay popular unless they deliver great gameplay and decent returns. The theoretical return to player of 96.96% in Jack Hammer slot game is a big temptation to players to join this crime-fighting crusade themselves. With a volatility rating of “low”, this games should also keep regular wins coming. The independently-spinning symbols that make up the 15 reels aren’t just visually arresting, they bring a new dimension to gameplay that is boosted by the trademarked NetEnt Sticky Win feature and back it with a big-paying free spins round. Jack Hammer welcomes you to test its features by playing for free. Why waste your cash when you play for free? Use the different betting options to set a bet that’s right for you. Experiment with the Autoplay feature and spin those reels to see just how long it takes to land the bonus features or a decent win. The layout, design, payouts and bonus features are identical to playing with real cash – but naturally, you won’t be able to keep what you win. Jack Hammer slot machine features a highly animated design which you would typically find in a comic book. The 5×3 grid formation features different cartoon-style images in different squares, all of which tell their own story. Pay lines are highlighted in various coloured speech bubbles to the left and right of the reels. The backdrop is of New York City, where dark streets can fall to the horrible antics of Evil Dr Wuten. Use the control panel to the lower of the reels to set your bet, spin the reels and monitor your bankroll, bets and wins. The ‘I’ icon is where you will find the paytable of payouts, rules on how to play and the various win lines. The kapow wild symbol holds no monetary value. Instead, it replaces other symbols (bar free spin symbols), to create winning combinations where they may have been missed. Jack Hammer is the highest paying symbol, with a top prize of 1000x your stake – but this prize is only awarded when five of a kind fall on an active win line. Evil Dr Wuten with a multiplier of 300x for a full win line of symbols. The woman in distress rewards you with a top prize of 250x your stake, when five of a kind grace your win line. A multiplier of 200x is applied to your stake when a win line of matching newspaper boys, fall into view. The evil balloon has a top prize of up to 125x. The black cab has a multiplier of up to 100x on offer. The newspaper awards up to 75x your stake. Telephones offer a multiplier of up to 50x. Evil potion has a top prize payout of up to 40x your stake. A winning bet line, or 3 or more free spin symbols will trigger the Sticky Win feature. The reels with winning symbols are locked in place and all other reels re-spin for a chance of bigger wins. The reels will keep spinning with this feature, as long as there are new wins found. When no new wins are generated and sticky win ends, all active wins are paid. Five symbols award 10 free spins. Six symbols award 15 free spins. Seven symbols award 20 free spins. Eight symbols award 25 free spins. Between nine and fifteen symbols awards 30 free spins. During your free games, all wins are subjected to a 3x multiplier. Any mobile or tablet device will allow you to indulge in some comic-book action. When you launch Jack Hammer on mobile, you will need to rotate your device to landscape mode – to allow the slot machine to load. You spin button is no longer housed on the control panel, instead it’s situated to the right of the screen and almost covers the middle symbol of the fifth reel, but fear not, when those reels spin, the spin button will vanish and allow you to view the whole 5×3 grid of symbols. The control panel has changed from silver and green to black – this offers a more pleasant player interface. Your bets, bankroll, wins, the paytable and sound options are all housed on the control panel as normal. 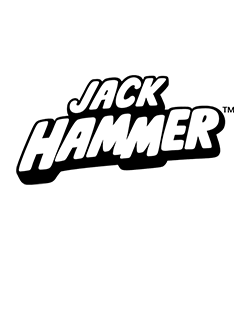 If you’re a fan of comic’s – you’re going to love Jack Hammer. Why just read comic books when you can immerse yourself into them? Jack Hammer allows you to play the part of the private eye, tracking down evil and reaping big rewards, but which how do you win the big cash? The top prize is awarded if you can trigger the free games, land the highest paying symbol as a full win line and make use of that 3x multiplier. Okay, so maybe it’s a big ask to get all those three to work in your favour, but there are plenty of generous wins to be had during the base game. Wins are few and far between, which means you will be playing for considerable lengths of time before triggering a big-value win, so make sure you look after your bankroll. Low stakes players won’t have to fear much – other than running out of funds before the free spins have been triggered, but high rollers have the issue of splashing big cash in every spin, with long periods with no returns. This medium to high variance slot is exciting, especially with that sticky win feature – but you’ll need a win to fall before this comes into play.